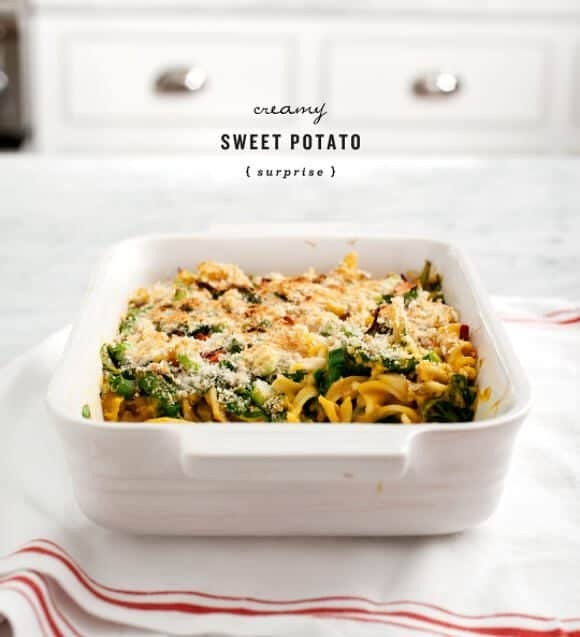 A creamy noodle casserole with mac n' cheese style vegan sweet potato sauce. Spinach, shallot, scallions + sage are baked in for extra nutrients and flavor! 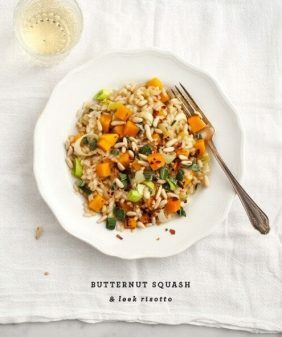 I first made this months ago with the very first butternut squash of the season. I had decided ahead of time that it would be a “non-photo” night since casseroles are not the easiest subject matter. Of course, after we made it, I was regretting not having the camera out because it tasted way too good not to share. If you’re vegan, this will taste like a baked mac and cheese. If you’re not vegan, it will just taste awesome, and you won’t really believe it’s vegan (surprise). If you use gluten free bread crumbs on top instead of panko, it’s gluten free (double surprise). In a medium saucepan, heat the olive oil. Add the shallots with pinches of salt and pepper. Cook until translucent. Add the sweet potatoes, garlic, broth and coconut milk. Cover and simmer until the potatoes are cooked and soft (about 15-25 minutes), stirring occasionally. Cook your pasta according to package directions, reserving some pasta water before draining. Set aside. To your sweet potato mix, stir in the dijon mustard, nutritional yeast, sage, and maple syrup. Add more salt & pepper. Transfer the mixture to a high speed blender (a Vitamix is recommended) and blend until smooth.Taste and adjust. Add some of the starchy pasta water to thin it out if it's too thick. Place the spinach in a large bowl and scoop the hot pasta noodles on top (so the hot pasta starts to wilt the spinach). Mix in the sweet potato sauce, thinning with more pasta water if necessary. Place in a baking dish. Top with the scallions, a sprinkling of panko, pinches of salt, pinches of red pepper flakes, and a drizzle of olive oil. Bake in a 350 degree oven for approximately 20 minutes (uncovered) until the top is brown and crusty. I turned on my broiler for the last couple of minutes to help with the browning. *the pan in the photo is 7x9 inches. I’m not vegan, but this looks incredible! I’d actually prefer this over Mac and cheese 🙂 And lovely photos too, I really like how you show the steps in smaller pictures. LOVE. I am so into baked pasta healthified and agree with you that they’re a challenge to make pretty. You’ve succeeded on all fronts! I am totally making this. I am immediately drawn to anything with ‘surprise’ in the title and this is no exception! I love a good vegan recipe. Especially a casserole. As a Southern family attempting to adopt a more plant based diet, I miss a good creamy casserole! Looking forward to making this one! Thanks for the recipe. I made this for dinner tonight and I want to eat the whole pan. It is so damn delicious. It’s way way better than Mac and cheese! This will definitely become a regular dinner! Ohhh this looks divine, just like all your recipes! I love everything I’ve made of yours! 🙂 Do you think this could be made a day ahead and then just cook in the oven the next day? I’m thinking this would be great to bring to Thanksgiving! Thanks! I would make the sauce ahead of time but make the pasta, assemble, and bake it on the day-of. I worry if you assembled it ahead of time the noodles would get soggy. The sauce will keep for a few days in the fridge, it also freezes well. 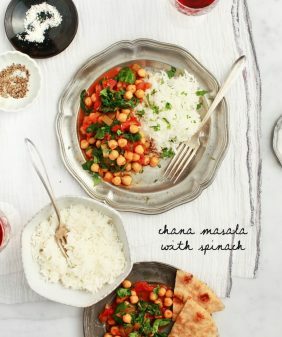 I just made this for dinner and needed to restrain myself from eating the entire pan – it was AMAZING! 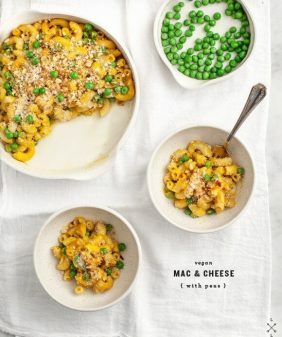 In my years as a vegan I have never found a recipe that has satisfied my ‘mac and cheese’ cravings let alone one that is also healthy enough to truly enjoy- and now I have! Thanks for this one! this looks really friggin good. hosting a friendsgiving potluck with the theme: not so traditional thanksgiving dishes. this is perfect! oh, I love that as a thanksgiving theme, sounds so fun! 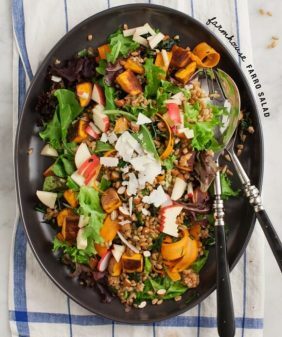 Do you think i can make this with roasted, mashed sweet potatoes? I was thinking of cooking down the shallots, and then adding those, with the sweet potatoes, coconut milk, etc to the vitamix. (basically skipping the simmering step). What do you think? yes that should work, they basically just have to be cooked before pureeing… Although I think it would be easier (less pans), to simmer them with other things – they didn’t take all that long to soften. Plus I think good things happen when all of those flavors simmer together for a bit. But it should work just fine either way. Not only that, but, you could then save the cooking water to use when making a soup. Yum! I made this last night, and I have to say, this is one of the best things I’ve ever had. Seriously. It tasted so much like real mac & cheese! The recipe made enough for my husband and me last night and lunch leftovers for me today. It was even good warmed up in the microwave! Thanks so much for sharing this – I’ll be making it again and again! yay, thanks for sharing Tammy! So I was browsing foodgawker and it’s official: I’ve found myself a new site to add to my RSS list. I love your pictures. They’re clean and simple and have that finishing touch with some nice typography. I’m a fan! I have DIED and gone to HEAVEN! This has just been polished off in my house by one vegan and one non. I did it with butternut squash. LOVE! yes! so glad you and everyone liked it! 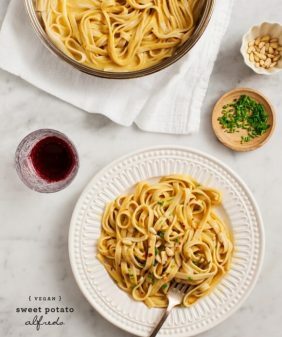 I’m thinking about making this for thanksgiving and was wondering if regular pasta could be substituted or if I should use the same type that you did. Thanks. Any pasta will work just fine – I just keep the brown rice pasta on hand because I enjoy it (and the health factor of it). It’s not a necessity though, feel free to use what you like and/or have on hand. I made two batches of this yesterday: one for a potluck and the other for home. The potluck was full of meat eaters and they devoured it. And my husband put a pretty good dent in ours at home too. I really liked the kick from the scallions and red pepper flakes on top. I did make it with kale instead of spinach (since that’s what I had) and it was delish. The coconut milk is a winner for making the sauce creamy. Thanks for a great recipe! I’m so glad everyone liked it! Thanks for sharing! 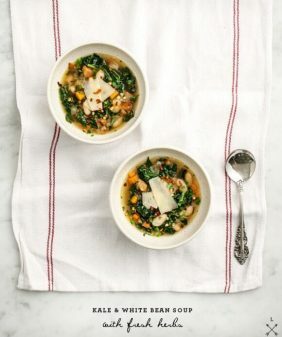 I made this for dinner tonight – with a mixture of spinach and baby kale – and it was so good! I’m saving the other half for my husband who is working late… But I keep sneaking little extra bites from his because it’s delicious! I’ve been looking at this recipe for days now. I so want to make it! The only thing is that I wonder how the nutritional yeast can be substituted. Do you have any suggestions? I can’t think of a direct replacement for nutritional yeast… if you eat cheese, freshly grated parmesan would be delicious in here. Or you could likely leave it out and this would still work (a little less cheese-like, but the sweet potato puree with the herbs should still be yummy). I can’t wait to make this tonight! A friend suggested your website and I have spent the most amazing afternoon looking at all of your recipes and deciding what to make for the next 20 meals! Your photos are incredible and I love these recipes! aw, that totally makes my day! I love your recipes! If i decide to use spaghetti squash, do i need to cook it in the oven ahead of time? Absolutely delish! I added some julienned sunned dried tomatoes and substituted half the pasta with chickpeas, it was brilliant! We made this dish last night and it was excellent. We skipped out on the bread crumbs and didn’t bake it, but it was still wonderful. Loved the twist on using sweet potato as a pasta sauce! This recipe is a keeper, thanks! Mmm, this was SO good. I went for it after making your vegan mac & cheese, which was also a big success…I actually used the pine nut & panko topping for this dish as well. Thank you for such a unique and delicious recipe! This looks great! I made something like this, with spaghetti squash as the noodles instead of pasta. Ooh man I was so excited about discovering your gorgeous site two days ago that that night I went home and made two of your dishes–this and the almond cinnamon coffeecake. They were both SO DELICIOUS!!! I could have almost drank this sauce. So. Good. And like the person above me, I used spaghetti squash instead of noodles and added the rest of my sweet potato + peas. A total success. Thank you! I wanted to report that I made this last night as a Passover break-the-fast meal. I’m currently breastfeeding and on a tricky elimination diet to help the little guy’s tummy troubles. I’ve been struggling with meal ideas and this was fantastic. I used butternut squash and hemp milk as the only substitutions and I wanted to lick my bowl, the sauce was so good! Thanks so much for all the great recipes! Hi Joanna, I’m so glad to hear that! This looks so yummy! I want to make it for Thanksgiving tomorrow, and I was wondering….. do you think I could put it together today, stick it in the fridge and then cook it tomorrow? Or will that dry it out? Has anyone tried making this in advance? Thanks! Cant wait to try it! Hi Cory – I haven’t made the entire thing in advance before so I can’t say for sure (It shouldn’t dry out but I’m not sure if the pasta will get soggy). If you try it, I’d leave the panko off until just before baking. Or if it’s helpful, I know that the sauce can definitely be made ahead of time. 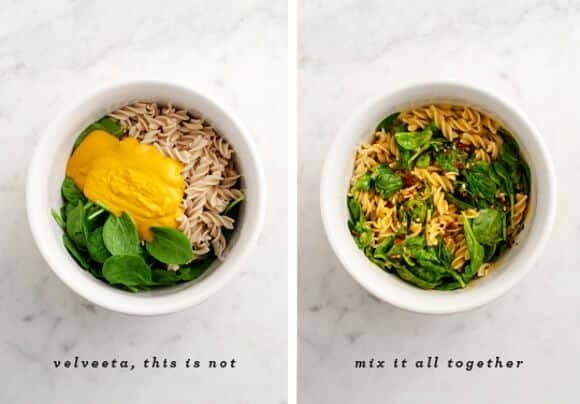 I’ve kept it in my fridge for days before mixing it with the pasta, etc. It gets thicker in the fridge but you can thin it out with a little water. I’m excited to try out this recipe! Do you think that I could double it and use a larger pan? yum this sounds really nice. Thanks for putting this up. So tasty! But I couldn’t add the milk, or it would have been too thin. Oh god, the sage was so lovely, it felt like October around here! Do you think this would freeze well? My friend is having a baby and I want to gift her a dinner she can get out whenever her and her family need something. They are vegan and gluten free which makes it more challenging. Thanks! Hi Jenna, I haven’t tried freezing it, but I think it would be fine. They would just have to bake in the oven until the middle is fully warmed through. Hi Honor, I don’t think vegan ricotta is necessary in this recipe, it’s pretty creamy as it is. If you wanted to add it, I would add it near the end of the bake time so that it warms through without drying out too much.